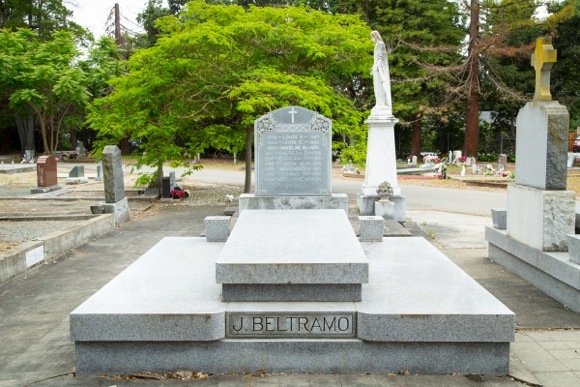 Holy Cross Cemetery, located at the intersection of Santa Cruz and Avy in Menlo Park, is a place that hundreds pass by daily, but we’re guessing few residents venture in, or know its history, unless they have deep Catholic roots in the community. That assumption — and a couple of upcoming public events — prompted us to visit with the cemetery’s superintendent, Kathy Wade, who’s held that position for the past 12 years. The cemetery has been in existence since the late 1860s. It was acquired by Nativity Church (located on Oak Grove Avenue) in 1883, which gave it its name, Holy Cross Cemetery. The initial layout and landscaping of Holy Cross was undertaken by world-renowned landscaper, Michael Lynch, whose projects included many of the grand residences of that era. In the 1950s, burials from the first St. Denis Catholic Church were relocated to Holy Cross when the Stanford linear accelerator was constructed. Kathy explained that the cemetery offers both traditional casket burial as well as cremation interment to people of the Catholic faith and their relatives. “I’m here to serve the families. I help them select the grave and help with monument orders. I coordinate the burial arrangements and am here at the grave site for each interment. John T. Doyle, Elena Atherton Selby, Michael Lynch, Matthew Crowe, John Murray, Giovanni Beltramo, Frank and Mary Roach, William and Margaret Warren are among the early local families who are buried at Holy Cross. “People walking around can get a real sense of the history of the area,” said Kathy, whose father and grandparents were also involved in the cemetery industry. 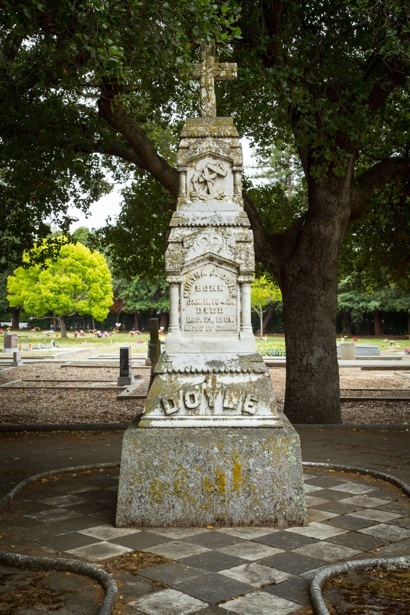 The Menlo Park Historical Association is sponsoring a tour of Holy Cross on May 28 led by historian Michael Svanevik; space is limited and participants must reserve in advance. On Memorial Day, Monday, May 30, there will be an outdoor Mass at the cemetery at 11:00 am that is open to the public.